Karthik Krishnaswamy of NGINX, Inc. Application programming interfaces (APIs) have become central to the digital economy. Forbes dubbed 2017 the year of the API economy. According to Programmable Web, the de facto journal of the API economy, APIs have witnessed explosive growth over the last five years. Since January 2014, an average of more than 2,000 public APIs have been added per year, and today there more than 19,000. What accounts for the dramatic growth in the use of APIs? APIs help drive innovation and accelerate time to market. They provide new opportunities to generate revenue and build partnerships with third‑party developers as well as your entire business ecosystem of suppliers, distributors, resellers, and even customers. Google Maps is an illustrative example. Many third‑party websites and applications embed a Google map to help end users pinpoint a retail location or get directions. It doesn’t cost the end user anything to access the map, but after a certain number of clicks Google charges the site for each API call. And Google’s not the only company in the business of selling access to its API. Even back in 2014, Salesforce.com generated more than 50% and Expedia close to 90% of annual revenue through their APIs. APIs also help break down silos by unlocking access to data across various internal systems. Providing a well‑defined interface reduces complexity and costs by eliminating the need to develop custom interfaces for different client applications, enabling developers and other functional teams to collaborate faster and easier. Last but not least, APIs are foundational to application modernization initiatives that use microservices, as they are primary interface for communication among the microservices. Whether you want to access data from monolithic applications or build a new application using microservices, API gateways are crucial to delivering reliable and high‑performing APIs. NGINX is already the industry’s most ubiquitous API gateway. NGINX Plus offers robust functionality such as request routing, rate limiting, and API authentication. It also helps you to accelerate performance of your applications by caching common API responses and reducing load on API endpoints. NGINX technology powers Capital One’s developer portal, Devexchange. It has enabled the company to scale its applications to 12 billion operations per day, with peaks of 2 million operations per second at latencies of just 10–30 milliseconds. Third‑party developers and partners can provide a first‑class digital experience for their customers as well as create new revenue streams by using Capital One’s APIs to open bank accounts, generate personalized credit card offers, and track customer rewards. Infrastructure & Operations and DevOps teams have to grapple with many challenges as the number of APIs and API gateways increase. All these APIs need to be managed in an efficient manner across their entire lifecycle – definition, publication, testing, operation, ongoing maintenance, and analysis to assess the value of APIs. A developer portal that exposes all APIs and facilitates easy consumption of APIs via robust documentation must be provided. Managing an API gateway must not degrade the performance of the gateway itself, which is responsible for routing traffic. That’s where NGINX Controller comes in. We are delighted to announce the new API Management Module in NGINX Controller 2.0. The module combines the raw power and efficiency of NGINX Plus as an API gateway with new control‑plane functionality and a simple user interface that enables Infrastructure & Operations and DevOps teams to define, publish, monitor, and analyze APIs, while keeping developers in control of API design. API definition and publication – Create multiple API definitions and their component resources, manage upstream groups and their backend servers, route resources to upstreams, and publish the resulting configuration to NGINX Plus instances. Rate limiting – Mitigate DDoS attacks and protect your applications from being inundated with malicious or errant API calls by setting request and bandwidth limits. Authentication – Authenticate calls made to your APIs using API keys and JSON Web Token (JWT). Monitoring and alerting – Get deep visibility and critical insights into more than 200 advanced performance and transaction metrics for NGINX Plus instances. You can set thresholds for these metrics and receive alerts when there’s a breach. Built‑in and customizable dashboards enable you to assess the health of your API gateways. The NGINX Controller API Management Module provides API‑specific workflows for managing NGINX Plus as an API gateway. In the figure below, we have defined two APIs. NGINX Controller provides an easy, intuitive way to define APIs. In the figure below, we have defined a Warehouse API that provides access to two resources, for pricing and inventory. These resources can be deployed to the Production environment – this refers to the upstream servers where the API application code is hosted. 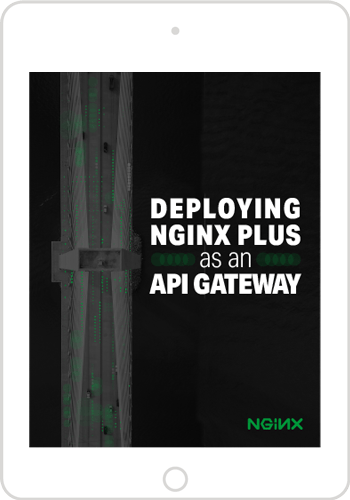 NGINX Controller drives the API gateway using native modules and best practice configurations. It eliminates the need for local databases or additional components that may introduce needless complexity and additional points of failure. The NGINX Plus API gateway (data plane) does not require runtime connectivity to NGINX Controller (control plane), so API runtime traffic is isolated from API management traffic. This maximizes performance by reducing the average response time to serve an API call and minimizes the footprint and complexity of the gateway. Compared to traditional enterprise API management solutions like Apigee and Axway, NGINX Controller provides a lighter‑weight, simpler, and higher‑performance solution that fully leverages the power of the NGINX Plus data plane. API providers to publicize their APIs and provide robust documentation of API functionality. API consumers to register their applications and provide feedback about the quality of the APIs. NGINX Controller currently serves as the control plane for load balancers. With the introduction of our API Management Module, we are executing on our vision to develop NGINX Controller as a central monitoring and management platform for a range of NGINX Plus data‑plane solutions, including load balancer, API gateway, and service mesh. General availability of NGINX Controller’s API Management Module is slated for Q4 2018. Please let us know your interest in this module so that we can promptly reach out to you when NGINX Controller 2.0 is released.